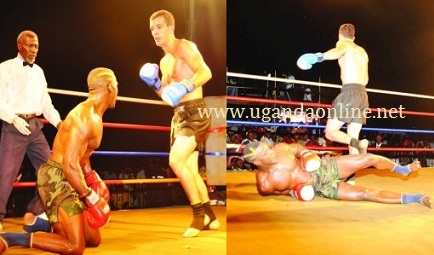 Golola of Uganda was either kneeling, sleeping or running during his fight with Zsamboki. Kyadondo Rugby Club was the place to be on Friday night when the Golola-Zsamboki Fight was on. Artistes like the Goodlyfe Crew and Iryn entertained fans minutes before the fight. Unlike other fights, Golola was so composed on this one and did not spit fire like he normally does. He hit the ring and actually did very well in the first round though he kept running from Zsamboki when the blows became too much for him to handle. Golola says his right leg was dislocated after he slid in one of the corners, so he advised his coach that the match be stopped instead of getting a knock-out. Golola of Uganda had fallen in the ring 10 times by the time he succumbed to Zsamboki Mate's well coordinated kicks and punches. Hungarian Zsamboki Mate was then declared the winner by unanimous decision. Speaking to the journalists outside the ring, Golola said: "Im a Ugandan and Im going nowhere, had it not been for my dislocated leg, I was going to beat Mate." They will now go for re-match at a future date. Looking at Mate's profile, it's not surprising that Golola Moses was clobbered. In 25 fights, Mate has 6 wins, 6 knock-outs and has hit Andreas Nagy three times, the Hungarian who beat Golola in the last fight. The fight was organised by Balaam.